5/10/2013–Raleigh NC–The Raleigh Wake Composite Squadron MER-NC-048, one of the largest squadrons in the North Carolina Wing, has enjoyed a long history of success. Squadrons are successful for many reasons, but key among them are dedicated leaders, committed membership, and support from the airport authority where the squadrons are based. On April 17, 2013 during the RDU Airport Authority Board meeting, Capt. 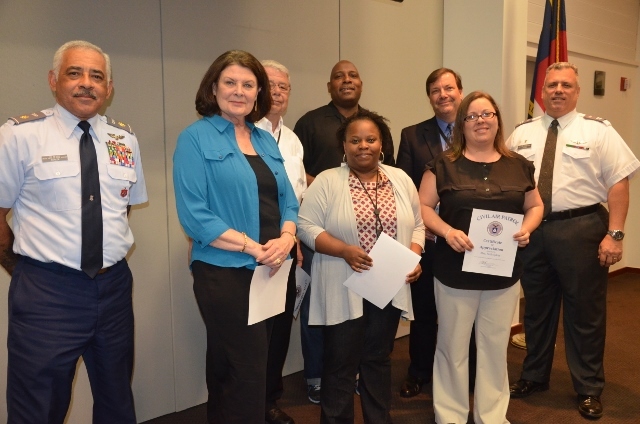 Richard Laviano, Squadron Commander, Raleigh Wake Composite Squadron, and Maj. Peter Bohler, Deputy Commander, presented certificates of appreciation to members of the airport staff for their professional service and support of the Squadron. Capt. Laviano has expressed the Civil Air Patrol’s gratitude to the RDU Airport Authority previously, but this ceremony afforded him the opportunity to demonstrate, publicly, the mutual support between RDU Airport and the Raleigh-Wake Composite Squadron, now and going forward. The squadron looks forward to many more years working with the authority as this partnership enables critical support towards the squadron’s mission of supporting the United States Air Force and the citizens of North Carolina.